Cập nhật ngày 14/5/2010 lúc 2:49:00 PM. Số lượt đọc: 4845. 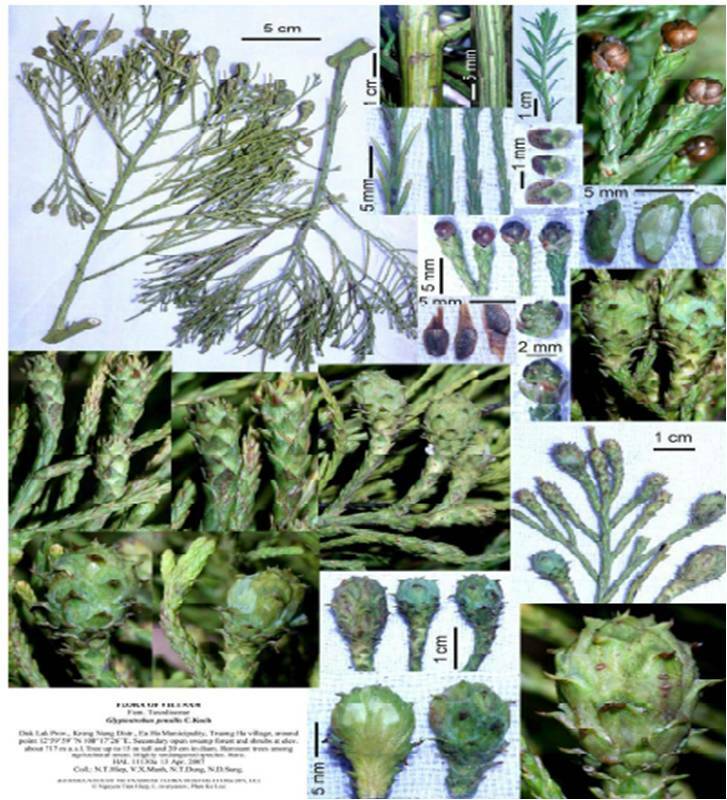 Taxodiaceae family closely related to Cupressaceae includes 9 genera - Athrotaxis, Cryptomeria, Cunninghamia, Glyptostrobus, Metasequoia, Sequoia, Sequoiadendron, Taiwania and Taxodium sporadically spreading in Asia, North America and Tasmania. Representatives of two monotype genera in this family – Taxodium distichum (L.) Rich. and Glyptostrobus pensilis (Staunton ex D. Don) K.Koch are ecological twin analogues forming similar mono-dominant permanently inundated damp swampy forests. At the same time, while native swamp forests with Taxodium distichum cover in our days endless coastal swampy territories on the south of North America, Glyptostrobus pensilis stands presently on the verge of full extinction in the nature. Glyptostrobus pensilis known also under the names – thông nước, thuỷ tùng (Vietnamese), shui song (Chinese), and “Water Pine” or “Chinese Swamp Cypress” (English), is typical Tertiary relict species formerly widespread prior to the Quaternary glaciations in vast areas of Northern Hemisphere, including the high Arctic, where it formed extensive swampy tropical and subtropical mono- and oligo-dominant forests. The species was reduced to its current range before and during the ice ages. Toward the years of our era, small sporadic relict stands of G. pensilis survived in lowland and hill damp swampy areas of southeastern China, central Vietnam and eastern Laos. The species vanished in nearly all these natural refugiums already during last centuries due to modern anthropogenic deforestation, land drainage, melioration and agricultural landscape transformation. Fortunately, in many areas of southern China G. pensilis observed now as a more or less common cultivated tree. It is reported presently in Fujian, S. Guangdong, S. Guangxi, Hainan, E. Jiangxi, E. Sichuan, SE. Yunnan and Zhejiang (Fu et al., 1999; Li and Xia, 2005). In our days, few miserable native stands of this unique relict species still survive only in central Vietnam known in Vietnamese literature as “Central Highlands” (Fig. 1) and in eastern Laos. These are alone places in the world where we still can see remnants of unique native relict coniferous forests widely spreading in Asia in Tertiary ages. 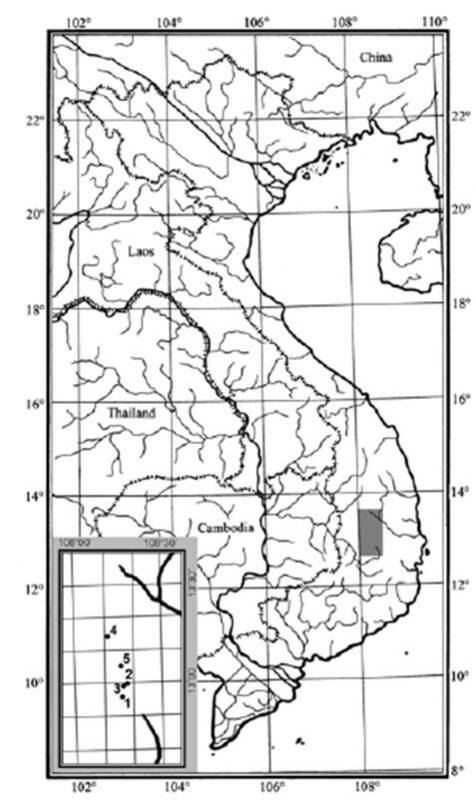 Results of preliminary studies of last remnants of G. pensilis native populations in Vietnam are presented below in form of standard taxonomical treatment with comments on ecology, population structure and natural conditions of its habitats. Glyptostrobus Endlicher, Syn. Conif. : 69 1847. Fig. 1. Map of modern distribution of Glyptostrobus pensilis in Vietnam. Glyptostrobus pensilis (Staunton ex D. Don) K. Koch, Dendrologie 2, 2: 191, 1873; Le Kim Bien, Phan Ke Loc, Fl. Taynguyen. Enum. : 220, 1983; Phan Ke Loc, Journ. Biol. (Ha Noi), 6, 4: 10, 1984; Nguyen Tien Hiep, Vidal, Fl. Cambod. Laos Vietnam, 28: 60, 1996; Pham Hoang Ho, Ill. Fl. Viet Nam 1: 222, fig. 891, 1999; Nguyen Tien Hiep et al., Vietnam Conifers: 60, 2004. Thuja pensilis Staunton ex D. Don in Lambert, Descr. Pinus, ed. 2, 2: 125, 129. Figs. 2 & 3, 1824. Thuja lineata Poiret, Encycl. (Lamarck) Suppl. 5: 303, 1817. Juniperus aquatica Roxb., Fl. Indica 3: 838, 1832. Taxodium heterophyllum Brongn., Ann. Sci. Nat. Sér. 1, 30: 184, 1833. Taxodium japonicum (Thunb. 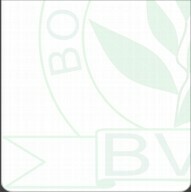 ex L.f.) Brongn. var. heterophyllum Brongn., Ann. Sci. Nat. (Paris) 30: 184, 1833. Taxodium japonicum Brongn., 1839, Ann. Sci. Nat. (Paris), Sér. 2, 12: 232, non Brongn., 1833. Taxodium sinense J. Forbes, Pinetum Woburn. : 179, 1839. Glyptostrobus heterophyllus (Brongn.) Endlicher, Syn. Conif. :69, 70, 1847. Sabina aquatica (Roxb.) Antoine, Cupress.-Gatt. : 70, 1857. Cupresopinnata heterophylla (Brongn.) J. Nelson, Pinaceae: 62, 1866. Cupresopinnata sinensis (Forbes) J. Nelson, Pinaceae: 62, 1866. Glyptostrobus sinensis A.Henry ex Loder, Gard. Chron.,Ser.3, 66: 259, 1919. Glyptostrobus aquaticus (Roxb.) R. Parker, Indian Forest. 15: 61, 1925. Thuja lineata auct. non Poir., 1817. Glyptostrobus lineatus auct. non (Poir.) Druce, 1917. Thuja orientalis auct. non L.: Lour., Fl. Cochinchin. : 580, 1790,; id., Flora Cochinchin. 2: 712, 1793. Described from SE. China (“Province of Guangdong”). Type (“G. L. Staunton s. n.”) – BM. Description (species description is based solely on studied wild Vietnamese specimens): Tree evergreen, semi-deciduous, monoecious, to 25 m tall and to 1.5 m d.b.h. (diameter at breast high) with approximately estimated age to 400 years, markedly buttressed at the base. Trunk erect, straight, occasionally particulated from the base into 2-3 (-5), commonly unequal boles, formation of several stems in individual tree due to natural particulation gives superficial impression of separate specimens planted in cultivation closely together as was speculatively suggested by some authors (Farjon, 2005); main branches more or less whorled. Crown ovate to pyramidal, becoming broader with age, lower branches spreading, upper ones sub-erect. Air roots (pneumatophores) few, to 0.6 tall and 0.3 m thick, grow from lateral roots, and spread up to 0.5-5 m around tree base. Bark thick, soft, grey to brown, longitudinally fissured, exfoliating into long papery irregular ribbons. Branchlets dimorphic, perennial and annual. Perennial branchlets more or less long, usually remaining for several years, ridged and grooved, with whitish lines of stomatal dots and decurrent leaf bases, often fertile. Annual branchlets short, always sterile, deciduous as unit. Leaves spirally arranged, dimorphic; on perennial shoots leaves sessile, scale-like overlapping to subulate spreading, relatively thick, triangular to quadrangular in cross section, persistent for 2 or 3 years, cowered with numerous white stomatal dots; leaves on annual shoots, unclearly 2-ranked, flat, thin, oblong to linear, falcate, 5-20 mm long. Pollen (male) cones terminal on short, erect branchlets bearing scale-like leaves, solitary, globose to broadly-ovoid, 2-6 mm long, 2-4 mm wide, brown to dark brown. Microsporophylls 8-20, spirally arranged, sessile, broadly-ovate, 1.5-2 mm long, 1-1.5 mm wide, oncave; pollen sacs 4-7, palmately clustered at the base of microsporophyll, green to yellowish-green, globose to broadly-obovate. Seed (female) cones terminal, globular to obovoid, pale green, glaucous, later brown, 1.2-22 mm long, 10-15 mm wide, on short erect broadening peduncle covered with triangular scale-like acute leaves, which become similar with seed cone scales toward the peduncle apex; sterile (cone) bract and seed bract completely connate into scale (seed-scale complex) with only free triangular, acute recurved apex of sterile bract. Seed cone scales 12-22, spirally arranged, sessile, thin woody, obovate to spatulate-triangular, recurved, 8-12 mm long, 3-5 mm wide; basal scales sterile; median scales 2-seeded, with rough warty teeth at apex and triangular mucro above their centre; apical scales ligulate, multiangular, sterile. Seeds dark brown, ellipsoid, slightly flattened, 5-6 mm long, 2.5-3.5 mm wide, with terminal thin, brownish, oblique attached, triangular, wing about 3 mm long, unequally bilobulate at the apex. Seed cones ripening and shedding mature seeds in November – December. Fig. 2. Digital herbarium specimens of Glyptostrobus pensilis from Vietnam, HAL 11130a (photographs of Leonid V. Averyanov). Former distribution: Wide tropical and subtropical areas in Northern Hemisphere during Tertiary ages. Present distribution: Central Vietnam, Dak Lak Province, only 5 close locations (Fig. 1), eastern Laos, Borikhamxai Province, about dozen small populations in very limited area allied to Vietnamese border. Also was reported from southern China, where no longer exist in the wild (Fu et al., 1999). In our days cultivated in many provinces of southern China, as well as in some countries outside it’s primary area, commonly in lowland, damp, riparian lands, river deltas, sometimes along rice fields, on flooded or waterlogged soils, commonly near sea level (Dallimore et al., 1967; Vidakovic, 1991; Fu et al., 1999). Specimens examined: Location 1: Dak Lak Prov., Krong Buk Distr., Buon Ho townlet, around point 12º56’07’’N 108º16’57’’E, open wet low slope of small river in the center of town among agricultural private vegetable fields, alone much decreased tree about 19 m tall with bole 66 cm in diameter (d.b.h. ), 1 April 2008, N.T.Hiep, L.Averyanov, P.K.Loc, N.T.Vinh, P.T.Duyen, HAL 11357 (HN). Location 2: Dak Lak Prov., Krong Nang Distr., Ea Ho Municipality, Truong Ha village, around point 12º59’59’’N 108º17’26’’E, secondary open swamp forest and shrubs at elevation about 717 m a.s.l., tree up to 15 m tall and 20 cm in diam, few remnant trees among agricultural areas, 13 Apr. 2007, N.T.Hiep, V.X.Manh, N.T.Dung, N.D.Sung, HAL 11130a, d-EXSICCATES OF VIETNAMESE FLORA 0102/HAL 11130a (HN); Krong Nang Distr., Ea Ho Municipality, Truong Ha village, around point 12º59’59’’N 108º17’26’’E, secondary open swamp forest and shrubs at elevation about 717 m a.s.l., tree up to 15 m tall and 20 cm in diam., remnant trees among agricultural areas, 13 Apr. 2007, N.T.Hiep, V.X.Manh, N.T.Dung, N.D.Sung, HAL 11130b, d-EXSICCATES OF VIETNAMESE FLORA 0103/HAL 11130b (HN). Location 3: Dak Lak Prov., Krong Nang Distr., Ea Ho Municipality, Trap K’Sor Glyptostrobus pensilis Species/Habitat Protected Area, 12º59’07’’N 108º17’02’’E, evergreen closed swamp forest on alluvial soils in flat swampy valley between hills at elevation about 706 m a.s.l., few decreased trees up to 15 m tall, 13 March 2008, N.T.Hiep, Averyanov L., P.K.Loc, N.T.Vinh, N.S.Khang, T.H.Thai, HLF 7111 (HN); Krong Nang Distr., Ea Ho Municipality, Trap K’Sor Glyptostrobus pensilis Species/Habitat Protected Area, around point 12º59’12’’N 108º16’50’’E, secondary shrubs and grasslands on seasonally wet, swampy gray soils on the place of extinct primary swamp forest at elevation about 706 m a.s.l., tree 4-6 m tall, very rare, few much decreased relict trees scattered on the territory of reserve, 1 April 2008, N.T.Hiep, L.Averyanov, P.K.Loc, N.T.Vinh, P.T.Duyen, HAL 11349 (HN); 2 April 2008, N.T.Hiep, L.Averyanov, P.K.Loc, N.T.Vinh, P.T.Duyen, HAL 11358 (HN); Krong Nang Distr., Ea Ho Municipality, Trap K’Sor Glyptostrobus pensilis Species/Habitat Protected Area, evergreen closed swamp forest on alluvial soils in flat swampy valley between hills at elevation about 706 m a.s.l. around point 12º59’11’’N 108º17’06’’E, tree up to 24 m tall and 79 cm in diam., 27 November 2008, P.K.Loc, N.H.Cuong HAL 11946 (HN); around point 12º59’11’’N 108º17’04’’E, tree up to 24 m tall and 90 cm in diam., 28 November 2008, P.K.Loc, N.H.Cuong HAL 11947 (HN); around point 12º59’19’’N 108º17’07’’E, tree up to 24 m tall and 90 cm in diam., 28 November 2008, P.K.Loc, N.H.Cuong HAL 11948 (HN); around point 12º59’16’’N 108º16’47’’E, tree up to 24 m tall and 90 cm in diam., 29 November 2008, P.K.Loc, N.H.Cuong HAL 11949 (HN). Location 4: Dak Lak Prov., Ea H’Leo Distr., Ea Ral Municipality, Glyptostrobus pensilis Ea Ral Species/Habitat Protected Area, around point 13º13’54’’N 108º11’03’’E, primary swamp coniferous forest with Glyptostrobus pensilis at elevation about 570 m a.s.l., tree to 20 m tall, mono-dominant of coniferous forest, 4 April 2008, N. T. Hiep, L. Averyanov, P. K. Loc, N. T. Vinh, P. T. Duyen, HAL 11406 (HN). Location 5: Dak Lak Prov., Krong Buk Distr., Chu Ne Municipality, Buon Rah Distr. protection site, around point 13º04’53” N 108º16’01” E, at elevation about 705 m, few relictual trees 20-25 m tall and 150 cm in diam., 2 December 2008. P.K.Loc, N.H.Cuong, HAL 11950 (HN).